Şervîn Mazlum, the council member of PJAK (The Free Life Party of Kurdistan), explained that if the government of Iran would not recognize the Kurdish issue through means of peacefulness and dialogue, Kurds would defend and fight for their rights. 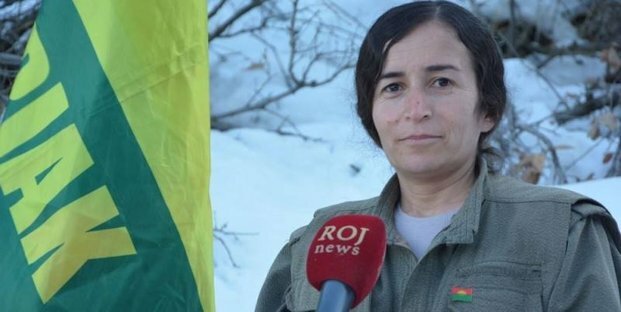 Şervîn also mentioned that despite the fact that the Islamic republic of Iran continues denying Kurdish rights and now more than ever before insist with their policies against the Kurds, PJAK along with other political parties in Rojhelat (Eastern Kurdistan) will maintain their goal to create unity. A delegation, including joint chiefs of PJAK members, met up with several other political parties, but due to the fact that the Kurdstan Democratic Party of Iran (PDKI) wasn’t prepared for such high-leveled meeting, the meeting got canceled. The council member of PJAK once again underlined that the Kurdish people were tired of the ongoing conflicts between Eastern Kurdistan political parties, including an internal war. Şervîn Mazlum added that it is time for Kurds to unite and fight for the Kurdish rights together. Despite the terms and conditions explained by Şervîn, including halt of military operations in 2011 and that the Iranian regime must stop mass arrests and executions of Kurdish political activities, Iran still failed to meet these requests, instead violated the ceasefire. Since 2014 PJAK has been a member of the KODAR (The East Kurdistan Democratic and Free Society), meaning it will defend the Kurdish people being under any attack and if the quest for peaceful resolution of the Kurdish people fails, KODAR will take a stand and protect their people. Şervîn added on this regard, that any changes taking place in Iran, will have an impact particularly in Rojhelat, a change that will in terms have an impact on other three parts of Kurdistan. By replacing the Iranian Revolutionary Guard forces and border troops with Sepah Pasdaran, that have been formed by Shia militia in Iraq, proofs that Iran wants to holds the regional changes outside of its borders. The council member of PJAK further pointed out that the Iranian government was forcing the Kurdish people to earn a living through the Kolberi 1, and even then, they target the Kurds making them faces death or tragedies on the borders. Şervîn also explained the horrible situation of the political prisoners, saying that the only solution is to publicly put pressure on the government. The council member of PJAK answered a question about recent attacks in Şengal region (Xanesor), explaining that invading forces could not be called a Kurdish political forces or peshmerga. “These forces are gangs. The people of Şengal have their own protection units and the PKK supported these units. In 2014 we rescued dozens of people and prevented a widespread massacre of the Êzîdî Kurds. The Êzîdî community no longer trust those who put them at risk for genocides “. 1. Kolbers (Carriers) are the people who are forced to carry goods for living, and carrying goods across the borders by passing mountains from unofficial custom points, in return to very low wages.